"Parents Are From Mars, Teenagers Are From Pluto". Are you having problems understanding you child? Is it getting more difficult to communicate? Why don't they listed to me anymore? Join us for a not to be missed workshop. Understand why they are different and whats going on inside their brains. 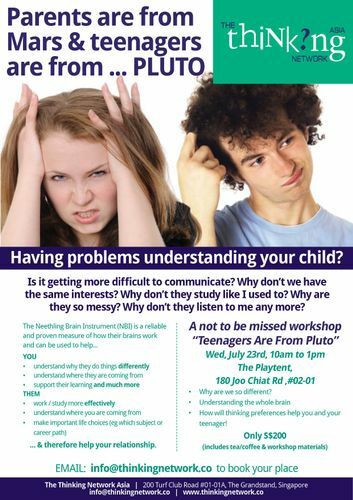 Learn how an understanding of thinking preferences can help you and your teenager! EMAIL INFO@THINKINGNETWORK.CO for more info and to book your place (limited spaces).